Did you suffer an injury in the Phoenix area as the result of a slip and fall or trip and fall accident? Falls can be very serious and there has been a rise in the death rate from this type of injury in the past decade. If you want to receive top compensation for your medical bills, lost wages, pain and suffering, and other damages, then call Lebovitz Law Group today. Don’t be persuaded by insurance companies and others who may tell you that you have to bear these losses on your own. Those responsible for creating an unsafe condition, for making a condition more dangerous, or for failing to observe and eliminate the unsafe condition, can be held liable for your injuries. What is a Fall Accident? When people think about a fall accident, they might imagine a wet floor in a supermarket. But these kinds of accidents can happen anywhere and at any time. They can occur from a slip and fall or a trip and fall in shopping malls, outside on the street or in a park, or even in someone’s home. The cause may land anywhere on the spectrum from water or some other liquid on the ground to an uneven sidewalk. In many of these cases, another person or entity is at fault when their negligence caused or contributed to your injuries. Supermarket falls. Slip and fall accidents in supermarkets are not at all unusual. The floors in these stores tend to be tile of one sort or another, and the addition of water, spilled food or any liquid causes potential dangers to customers. Produce departments often have misting systems that periodically wet the vegetables on the shelves; in the process, they can also wet the floor in that area. In establishing negligence, sometimes the fault is in creating the situation in the first place, for example, when an employee mops the floor, and fails to place warning signs to alert customers to the danger of slipping on the wet floor. In other cases, such as when liquid is spilled on the floor by a customer, the unsafe condition may not have been caused initially by the store, but failure to alert customers and clean up the spill promptly may have contributed to your accident and therefore your injuries. Public parks and facilities. If you’ve ever visited the rest area in a public park, you will understand that maintenance is not always first rate at these facilities. Wet floors are often left for hours, and those wet floors are a safety hazard for the men, women and children who frequent the facilities. In addition to the rest rooms, hazards can exist as the result of failure to maintain or repair paths, as well as allowing (even inviting) people, often children, to use substandard and unsafe playground equipment. In all these cases, your injuries may have been caused by the negligence of others. With respect to public facilities, your accident lawyer must be aware that the time periods for commencing a lawsuit, as well as providing notice of your claim, are different than in other cases, where only private individuals and private companies are involved. Failing to adhere to these requirements can result in the loss of whatever rights you have to seek compensation from the public entity. Slip and fall accidents in retail stores and offices. Supermarkets are not the only retail establishments where conditions can lead to a fall that results in injury. Additional places where these conditions commonly occur include automotive and hardware stores, as well as office buildings, and the causes of the unsafe conditions include spilled oil and other fluids; torn or loose carpeting; unsecured wires or cables on the floor, steps that are unlit and/or unmarked, and the list goes on. The creation of, the failure to prevent, and/or the failure to re mediate such conditions, in most cases, means that the tenant, owner, building manager, or some other person or entity has been negligent, and may therefore be liable to you for the injuries you suffered in their premises. Parking lot trip and fall accidents. Injuries occur in parking lots on a regular basis. The causes, however, are not always the same. The most common reasons that someone would trip and fall in a parking lot include spills, debris, uneven pavement, loose pavement, snow and ice (primarily in the higher elevations) and inadequate lighting. Any of these conditions can lead to an unsuspecting person (often carrying packages or perhaps holding a small child) to trip, fall and suffer injuries. Sidewalk slip and fall accidents. The causes of trip and fall accidents on sidewalks are similar to those in parking lots. Uneven surfaces, debris, loose concrete or other sidewalk material, among others, can all lead to falls which result in injuries. The right Phoenix trip and fall accident attorney will be able to advise you who may be responsible for the condition, and therefore who could be liable to you. In some cases, it may be the homeowner, tenant or manager of the premises. In others, a governmental agency or department may bear some or all of the responsibility. It is essential, in every case, that your attorney identify all possible parties who might be liable to you in your claim for compensation for your injuries. These are just some of the many possible causes of slip and fall accidents. No two cases are identical, and investigation and hard work on the part of your lawyer can make all the difference. The right Phoenix slip/fall or trip/fall accident attorney will be able to advise you on who may be responsible for the condition, and therefore who could be liable to you for compensation. In some cases, it may be the homeowner, tenant or manager of the premises. In others, a governmental agency or department may bear some or all of the responsibility. It is essential, in every case, that your attorney identify all possible parties who might be liable in your injury claims. How Do You Prove Injuries? 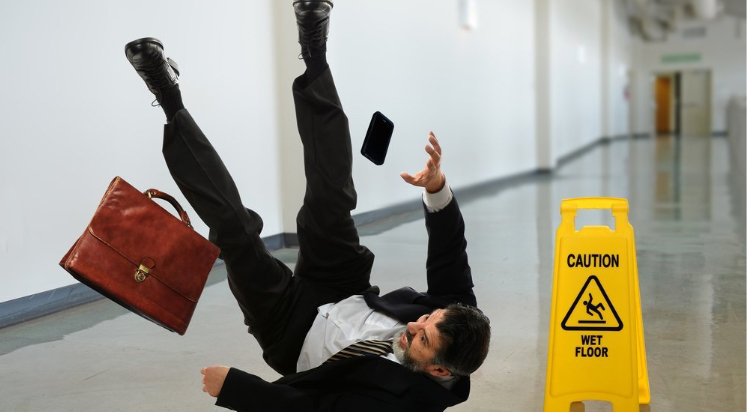 The use of the terms “slip and fall” or “trip and fall” may sound to some as if the incident is a minor one. A scraped knee, perhaps, or some minor cut or bruise that can be handled with a Band-Aid. In fact, slip/fall and trip/fall accidents occur often, and in many cases the injuries are serious. Indeed, there are as many as a million hospital emergency room visits each year by people who are injured in fall accidents. You can suffer broken bones, lacerations that can lead to scarring and disfigurement, back injuries, and other painful conditions, some of them permanent. In many cases, it will be necessary to hire a medical expert, usually a physician, to establish the nature and mechanism of the injury, treatment options, etc. The right lawyer will be able to assist in finding the appropriate medical professional to provide evidence in the lawsuit and, if required, to assist in your continuing treatment. Get the Answers you deserve. The legal and insurance systems are confusing and intimidating. The Lebovitz Law Group has the experience and knowledge to guide you through them, and to help you get the maximum compensation you are entitled to. Feel Empowered. Lebovitz Law Group has successfully helped people just like you get compensation for their personal injuries. We will give you the knowledge, counsel and advise to help you make wise decisions for your physical, mental, emotional, and financial well-being. One on One Attention. You are important to us and we show it. Meet one-on-one for your initial consultation with our Managing Attorney, Brandon Lebovitz. Feel confident knowing that you will have Mr. Lebovitz’s personal attention every step of the way. Save Time, Money and Stress. We know you have already lost time, most likely money, and have suffered stress because of your personal injury. Your time is important and valuable. Let Lebovitz Law Group take it from here; we will fight hard to quickly get results for your case, while you focus on your recovery. At Lebovitz Law Group, we offer free, no obligation consultations. If we accept your retention of our firm, we will finance your case costs. We handle all communications with the insurance companies, their adjusters and lawyers. We only get paid when we obtain a favorable settlement or verdict in your case, and we stand by that promise. See what former clients have said about Brandon Lebovitz! At LLG, we offer free consultations, finance your case costs, and handle all communications. Our clients pay nothing unless we obtain a settlement or verdict in their case, and we stand by that promise. LLG is committed to quality, not quantity. As opposed to the volume-based churn-and-burn law firms, we provide the time, attention and detail required for top-dollar settlements and verdicts.